Universal Orlando is upping the adventure for kids with the introduction of its new Jurassic World Kids’ Suites at Loews Royal Pacific Resort. The highly themed suites will transport kids right to the island of Isla Nublar from Jurassic World where they can sleep among the dinosaurs. 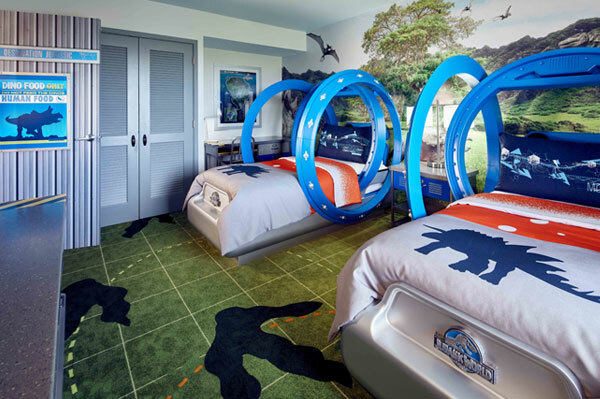 From the gyrosphere beds to the valley map carpet and dino-inspired bedding, kids will feel as if they have stepped right into their very own Jurassic World adventure. The spacious suites sleep up to five, giving parents privacy in the master bedroom while kids have fun in the themed connected room. For more details about the Jurassic World Kids’ Suites check out the official Universal Orlando Resort blog at https://blog.universalorlando.com/whats-new/jurassic-world-kids-suites.